Afghanistan have reclaimed top spot in the ICC Intercontinental Cup table after cruising to a comprehensive innings and 173 run-victory against Hong Kong in the final match of round six. Afghanistan (101 points) now sit in pole position with one round to go, their nearest rivals Ireland are on 12 points behind in second place. In the race for the title, Ireland need an outright win to secure 14 points against Scotland in round seven to stand a chance of retaining the trophy. 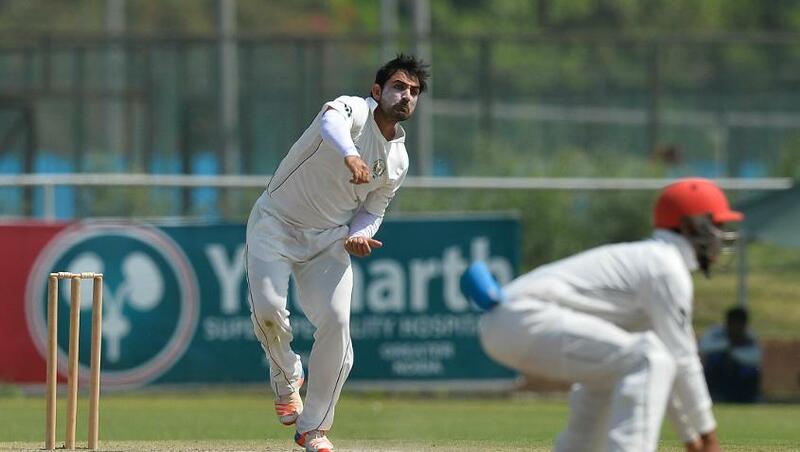 Afghanistan leg-spinner Rashid Khan's five-wicket haul and Javed Ahmadi's century were the foundations of the comprehensive victory, as Hong Kong were bowled out for just 142 in 47 overs in their first innings. For Hong Kong, after Dawlat Zadran had accounted for Matt Stiller (6) early, Christopher Carter (21), Babar Hayat (39) and Nizakat Khan (16) fell to the 19-year-old Rashid. Hong Kong slumped to 97 for seven wickets inside 33 overs. Waqas Khan (23) and Waqas Barkat (23 not out) added some runs later in the innings, before Rashid returned to finish off the innings with his haul of five for 65. In reply, Ahmadi and Ihsanullah Janat shared a 124-run opening-wicket stand to put Afghanistan in the driver’s seat. The two scored at a good pace before Anshuman Rath dismissed Ihsanullah (63). Ahmadi scored 108 from 113 balls, which included 16 fours and two sixes. Captain Asghar Stanikzai scored 125 from 129 balls, and along with notable contributions from Ihsanullah Jannat (63), Rahmat Shah (57) and Mohammad Nabi (63), helped amass a lead of 323. Afghanistan declared on 465 for five in their first innings. A disciplined effort from the Afghanistan bowlers saw Hong Kong bowled out for 150 in 39.4 overs in their second innings on the second day of the four-day encounter. (59 not out) was the only batsman to post a significant score. Nabi, the offspinner, struck twice to remove Waqas Khan (8) and Ehsan Khan (8). Zahir Khan, the leg-spinner, took over by prising out the lower order with swift strikes. He finished with figures of four for 16, while Nabi, Dawlat and Rashid chipped in with two wickets each, as Afghanistan celebrated a huge victory. “We had hoped to win the match by an innings and wrap up the match quickly to get maximum points, so everything went according to the plan. We are looking forward to the round seven matches, where we can hopefully beat the UAE and win the ICC Intercontinental Cup." Round seven fixtures take place in the United Arab Emirates between 29 November and 2 December 2017 to crown the winner of the ICC Intercontinental Cup.